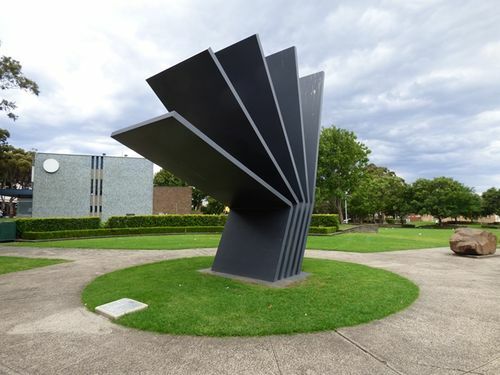 "Nike" is a 25 tonne painted mild steel sculpture commissioned to honour the steel industry. The name refers to the energy and poise of Nike, the greek winged goddess of victory and also Nike, the intercontinental ballistic missile, being raised in a time lapse sequence. The local steel industry commenced in 1927 with Charles Hoskins entering into an agreement with the state government to build a steelworks at Port Kembla, thereby commencing a long history of steel production that still continues to this day. Operations began in 1930 with one blast furnace of 800 tons capacity. In 1936, BHP acquired Australian Iron and Steel Limited and production at Port Kembla increased rapidly. The steel industry was a catalyst for growth for many decades, and laid the foundations for the city's economy, lifestyle and culture. C. R. Cavenagh & Sons Pty. Ltd.
P. B. Coleman Pty. Ltd.
Electric Power Transmission Pty. Ltd.
Gladstonbury Steel Fabrication Pty. Ltd.
Painting & Development Pty. Ltd.
Planner West & Partners (W`Gong) Pty. Ltd.